Champion Regian “The Immortal” Eersel exacted a measure of revenge while maintaining his stranglehold on the world super middleweight title with a stirring fifth-round knockout of challenger Matous Kohout at Lion Fight 38. Before a packed house at Foxwoods Resort Casino in Mashantucket, Connecticut, Eersel (47-4) completed a dominant performance with a knee to the body that ended the fight at 1:01 of the fifth and final round in the main event shown live on AXS TV Fights and Fight Network. 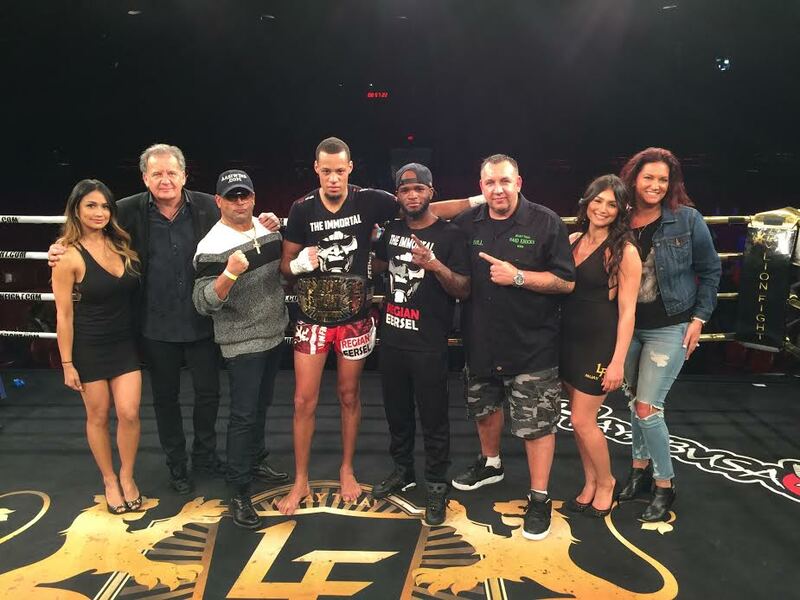 The victory was Eersel’s 10th in a row overall and fourth consecutive knockout under the Lion Fight banner. It also was a moment of sweet redemption for the Dutch fighter as his last defeat was to Kohout (36-10) back in 2016 in Kohout’s home town of Prague, Czech Republic. “The Immortal” opened the bout with a series jumping knees that stunned Kohout, and followed that a wicked three-punch combo in the second. In the third round, Eersel went after “The Mighty Rooster” again with high knees before putting him down in the fourth with a punch and knee-to-the-body flurry. Eersel put Kohout on the deck early in the fifth with left hook to the body just prior to him forcing referee Dan Miragliotta to call a halt to the bout with the fight-ending finishing blow. The Lion Fight 38 main card opened with three straight devastating knockouts. Alabama’s Cris “The Golden Leg” Mims (1-0) spoiled the coming out party for Rhode Island fan favorite Brian Bogue (0-1) as a spinning back elbow strike floored Bogue 25 seconds into the second round for the TKO victory. Another fan favorite was much more fortunate, however, as Boston’s Steve “Put Em To Sleep” Walker (2-0), a rising star at super cruiserweight, ultimately proved too powerful for rugged MMA veteran Rob Morrow (0-1), taking the win via knockout with a straight right 2:49 into Round 3. The most electrifying finish came courtesy of Brooklyn, New York’s Jafar “The Cookie Monster” Toshev (2-0) when his switch-kick blasted Jonathan George (2-3) face-first to the canvas at 1:47 of Round 1. Two other main card bouts went to the judges. New York’s Elijah “The Mayor” Clarke (7-1) got past retired U.S. Army Sgt. Juan Jackson (9-2) by scores of 50-45, 50-45, and 49-46 in a light heavyweight tilt, while Brooklyn’s Brett “The Threat” Hlavacek (18-5) dodged by Mississippi native Timothy Woods (8-2) with scores of 49-46, 49-46, and 50-45. Miguel Cadiz def. Shaun Shubert – unanimous decision. Lion Fight returns on Saturday, November 18th as the promotions debuts in England with partner Muay Thai Grand Prix for Lion Fight 39 live from The Indigo at O2 Arena in London. Headlining the card Chip Moraza-Pollard as he puts his Lion Fight cruiserweight title on the line and vies for the vacant MTGP cruiserweight title against England’s own Jordan Smith. 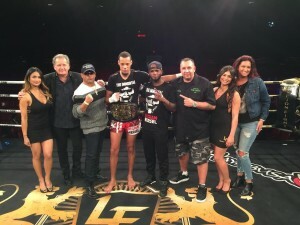 Please visit LIONFIGHT.com for news, information and event updates, and follow on Twitter @LIONFIGHT and @LionFightMuayThaiPromotions on Instagram.